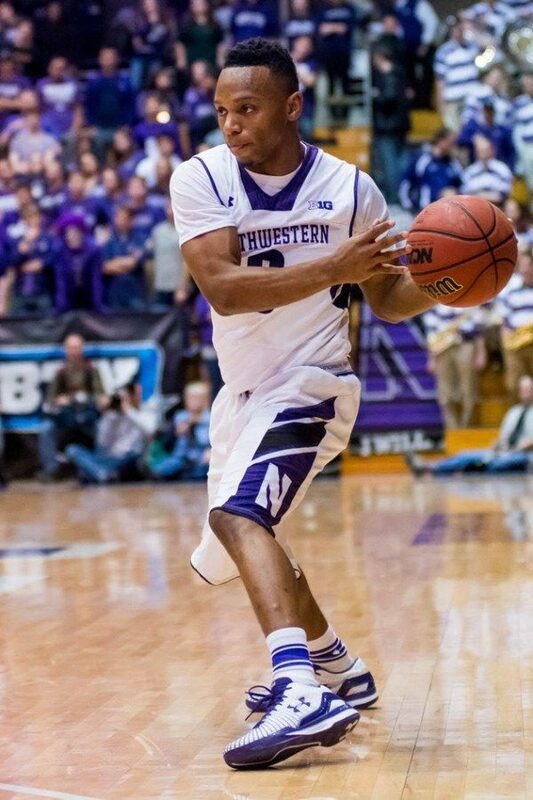 Johnnie Vassar makes a pass while playing for Northwestern basketball in 2014-15. Vassar announced his graduate transfer to Tennessee Tech earlier this summer. Former Northwestern men’s basketball player Johnnie Vassar dropped from federal court his antitrust lawsuit against the NCAA and Northwestern, and re-filed in Cook County circuit court a similar version of the lawsuit, now solely against the University, earlier this month. Vassar had filed the original suit in November 2016, alleging that an NCAA rule requiring student-athletes to sit out a year after transferring to another program — called the “year in residence” rule — violated antitrust law. In the same lawsuit, he also claimed Northwestern athletics and men’s basketball coach Chris Collins had used various illicit and demeaning tactics to “run him off” the team. Northwestern has steadfastly denied all claims and continues to do so, Northwestern general counsel Phil Harris told The Daily on Monday. In June, the U.S. Court of Appeals for the 7th Circuit affirmed in a similar case, Peter Deppe v. NCAA, that the “year in residence” rule did not violate antitrust law, and instead was “clearly meant to preserve the amateur character of college athletics” in a way that had already been upheld in prior cases. Given that ruling, Vassar and his legal counsel decided to voluntarily withdraw his suit from federal court and pursue a different course of action moving forward, said Elizabeth Fegan, a lawyer representing Vassar. The judge presiding over the Vassar case had been repeatedly continuing a motion to dismiss by the NCAA in anticipation of a Deppe ruling, Fegan said. Northwestern had also filed a motion to dismiss in January 2017, which was opposed by a motion filed by Vassar two months later. Vassar, a former top recruit who played fewer than four minutes per game in the 2014-15 season, his only as a player in Evanston, graduated from Northwestern in the spring and has since enrolled as a graduate transfer in the men’s basketball program at Tennessee Tech, another Division I school. By rule, graduate transfers do not have to sit out a year before playing like undergraduate transfers do. Fegan said the close timing of Vassar’s graduation and the re-filing of the lawsuit was purely coincidental. The original lawsuit alleged that Vassar was “berated” by Collins and placed in an “internship” that entailed various manual labor chores, including blowing leaves, salting sidewalks, wiping bleachers and carrying planks, in what he saw as an effort to motivate him to transfer and vacate his Northwestern athletic scholarship. When he did not transfer, Vassar claimed that his internship timecards were falsified in an attempt to create evidence on which to revoke his scholarship and that he was also “informally” offered a cash payment in value equal to his remaining scholarship, among other alleged misdeeds. The lawsuit states that Vassar was ultimately switched onto an academic scholarship, freeing up an additional athletic scholarship for the basketball team to use. The re-filed lawsuit contains the same facts and description of events but now presents nine causes of action (the original lawsuit presented only four). Fegan said those are “additional state laws claims,” such as both Intentional and Negligent Infliction of Emotional Distress, that were not applicable in federal court. Fegan said she hopes the legal proceedings will “pick up pace now” that they are in state court and that she hopes to be “close to trial” by a year from now. Reached Monday, Vassar declined a request for comment.